As late as the 17th century, meteors were still believed to be "thunderstones" that were produced by violent storms. Today, thanks to pioneering astronomers such as Edmond Halley, we now know the true origins of the extraterrestrial specks. They are the dust left behind by passing comets, meteorites and asteroids -- traveling at speeds of up to 160,000 m.p.h. across the night sky. Just up ahead, click on each link to find out where and when major meteor showers happen throughout the year. In the modern age, we now know that every meteor shower can be traced back to a specific celestial event. 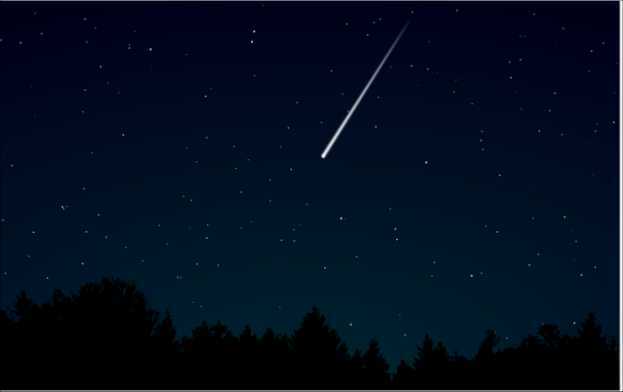 The actual source of the Leonid meteor shower, for example, is debris from the comet Tempel-Tuttle from which sand-sized specks continue to enter the earth's atmosphere each November. The more dramatic Orionids are actually bits of debris left over from Halley's Comet. The most famous meteor showers are notably regular in their timing, with peak viewing times usually limited to a "one night only" spectacular -- like the first major meteor shower of the year, the January Quadrantids. However, some meteor showers can potentially be visible for days depending on weather and location. The best time to view meteor showers are from midnight to the predawn hours when the sky is at its darkest, and the contrast greatest between the night sky and the streaks of light swiftly passing by. The less light visible, the more brilliant the meteor shower will appear, and a prime location out in the suburbs or countryside is always preferable to urban areas where bright city lights will impair viewing. Catch a falling star: Avoid ambient light from urban areas and head out to the suburbs or countryside. Even on clear nights, some type of viewing aid may come in handy for catching sight of even the faintest of falling stars, aptly named "telescopic" meteors. On super clear nights, forget the telescope and simply look up. For photographing meteors, a digital camera mounted on a tripod helps to steady the images that swiftly move across the sky. A quick trigger finger also helps, but even random clicks during the height of viewing "prime-time" will guarantee that you'll catch something! Be sure to have the camera focused on infinity and, if your camera permits, leave the shutter open for several minutes for the most spectacular photographic effects. Meteor shower - Wikipedia entry on meteors and their origins with information on historical and technical details on predicting their occurrence, overviews of famous and notable meteor showers with related photos, references and resources. Meteor Showers Online - A complete look at the celestial phenomenon with historical facts and the science behind it, with practical tips on best viewing techniques, educational resources, and related links. About Meteors - Brief but informative overview of common terms that help identify various sizes and types of meteors.